A 1 hour bus from Selcuk to Izmir, 1 ½ hour flight to Kayseri, followed by another 1 hour bus to Cappadoccia seemed like nothing given the drastic change in the landscape. As our plane landed the buildings looked like colorful scattered legos, then as we entered Cappadoccia the rolling hills dramatically changed into stalagmites resembling elf houses. Our hotel room was in a cave with the selves carved right into the wall, and a roof top patio where we were served breakfast as we watched the hot air balloons take off. To celebrate our first night, Kate, Patricia, and I found a cozy corner in Goreme Restaurant. 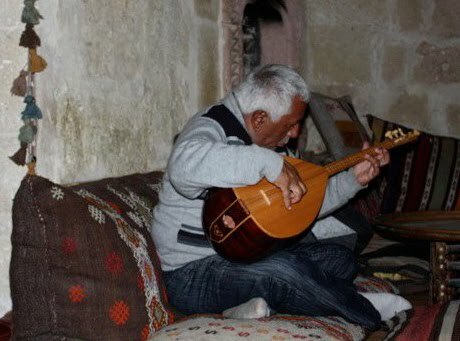 We took off our shoes and settled onto out pillows next to the old man that was singing and playing his oud and violin. The atmosphere would have been enough, but the food made the night even better. Our wine came out in a clay pot, the bread was steaming, and the hummus was the best I have had since going abroad. We sat for hours eating, drinking, and watching the old man play and sing. Tuesday we explored sites around Cappadoccia. Our first stop was the underground city where people use to take refuge during wars. The city went down eight stories and had everything from stables, to living quarters, to meeting halls, to churches. The farther down we went the narrower and shorter the hallways got, I almost had to crawl to get through. We stopped to taste the wine of Cappadoccia at a small wine tasting room, Kocabag wine from 2008. Then we visited a ceramics workshop where we watched a master spin a pot in less than 5 minutes. The showroom was overwhelmingly colorful, with each piece differently patterned various colors. Our last stop was the Goreme open-air museum. We walked between various stalagmites that were mostly churches with frescos inside that had been partially destroyed by the iconoclasts. There were also kitchens black from smoke, and dining halls with the table and benches carved right from the rock of the cave. 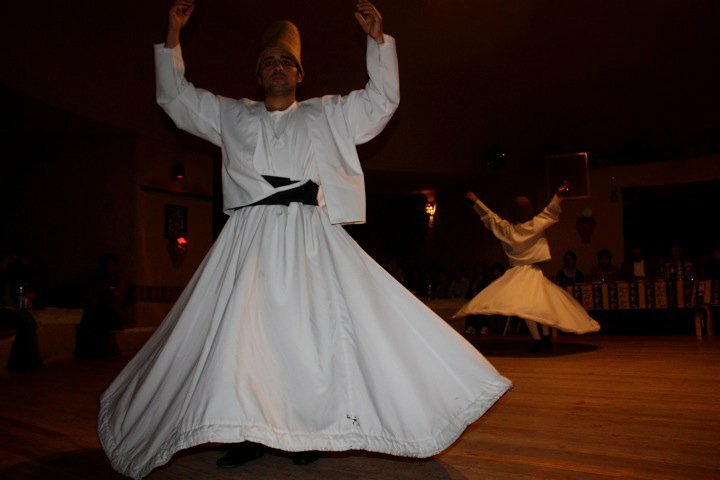 That night we went to “Turkish night.” I was excited to see whirling dervishes and other traditional dances, but got a tourist show instead. The dinner was bland and some of the costumes looked like Halloween costumes from a department store. We still had a fun night, but next time I’m in Turkey I want to see a real ceremony. For our last morning in Cappadoccia we drove out to Rainbow Ranch to go horseback riding. Seemed like the thing to do considering Cappadoccia means, “land of beautiful horses.” The horses were beautiful, and very spunky. 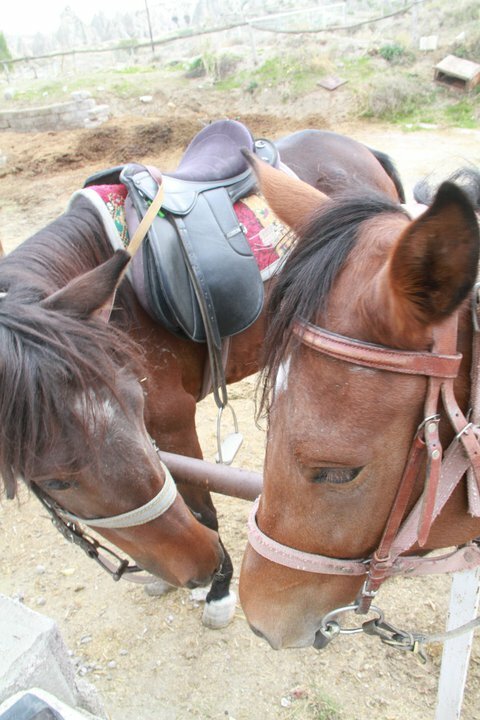 Some of the horses seemed on the verge of being crazy, and had a lot of personality. I rode an Appalachian, who at one point decided he didn’t want to wait for the rest of the group and would rather roll in the dirt. At first I thought he was going lame, I managed to get off as her fell over with only a few scratches only to realize that her was gleefully rolling in the dirt. Jerk. Brushed off and hopped back on for the rest of the ride. They took us through a valley under pigeon houses that people had carved into the rocks and through a small village with cobblestone streets.